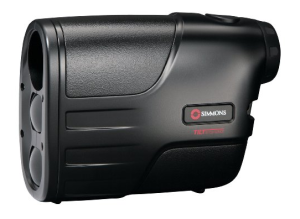 For new users or users on a budget, the Simmons LRF 600 Tilt Intelligence Laser Rangefinder represents an economical introduction to rangefinders. With a vertical design, the rangefinder is sleek and ergonomic. Good size and grip make the rangefinder both easy to use as well as comfortable to hold. With single-button technology, this rangefinder is easy to use. Its features are simple but effective. The rangefinder operates on a single 9V battery that holds up well over many uses. Priced just over $100, the rangefinder sports a rugged plastic exterior that holds up well outdoors. At just 7.7 ounces, it is a lightweight rangefinder that offers 4x magnification and an overall good field of vision. Simmons provides an affordable option with this rangefinder. It operates exceptionally in sunlight and with its sturdy casing is very durable. The Simmons LRF 600 Rangefinder is accurate within a yard at 300 yards, though the accuracy of its readings tends to drop at longer distances. Its vertical design and compact dimensions (4x2x3 inches) make the rangefinder portable and easy to store. With single-button operation, Simmons plays to users who are either new to rangefinders or who value simplicity over extra features. Either way, the single-button feature is easy to use. Past 300 yards, accuracy suffers on this rangefinder. Though Simmons advertises a range of 600 yards, the realistic range on the finder lies somewhere between 200 and 400 yards. Past 300 yards, accuracy is compromised. Unlike more advanced rangefinders, this device does not include an inclinometer. This absence requires the user to calculate angles and elevations on the fly. Depending on the experience of the user, this can pose a challenge that will further complicate the accuracy of the rangefinder’s readings. For an experienced user, the challenge of assessing elevation may be an intriguing challenge, rather than a frustration. The rangefinder performs well sunlight, but dim lighting makes the LCD screen difficult to read. Because Simmons eschewed filling the rangefinder with Nitrogen, the device tends to fog. The tendency for the viewfinder to fog up is a detriment in poor weather conditions. Finally, while the single-button operation of the device is simple, the response time of range readings is sub-optimal. The affordability of the Simmons LRF 600 is easily the most attractive feature of the device. With the low price point, extra features that you would find in some other rangefinders are sacrificed. Still, cost remains paramount, and Simmons delivers good value for the price of this rangefinder. With diminished accuracy after 400 yards and a visual sweet spot nestled somewhere between 200-400 yards, the advertised 600 yard spec is ambitious and, for most users, probably unattainable. Also, the difficulty of reading the LCD screen in any but the most ideal conditions is a definite drawback, as outdoor conditions vary widely within any given time period. The battery life that results from a single 9V, in an era of rechargeable devices, is remarkable. Although many comparable devices die after 1,000 or 1,500 uses, the battery life for the Simmons LRF 600 proves strong even after 2000 uses. The economical price of this rangefinder is reinforced by the knowledge that replacing batteries over the life of the device will not be a costly endeavor. There are rangefinders with more bells and whistles. There are rangefinders with better accuracy. However, Simmons presents a rangefinder that appeals to new users with its price and simplicity. The Simmons LRF 600 Tilt Intelligence Laser Rangefinder also appeals to experienced users who are looking for a rangefinder that is both affordable and durable.